Fashion TV-FTV, the global leader in fashion, multimedia and lifestyle content forays into the beauty &wellness segment with the launch of its first salon in India. This flagship store was launched in Rajouri Garden, India. ( Director, Fashion TV India & SAARC) said, “We are proud to announce the first ever FSalon by Fashion TV in India. We view ourselves not just as a salon, but an experiential brand. The idea is to provide high quality beauty and wellness services to our customers". Tamanna Singh and Col Gautam Singh (Master Franchise of F Salon, North India & owner of F Salon- Rajouri Garden) and their team brings 20 years plus of collective experience on table. 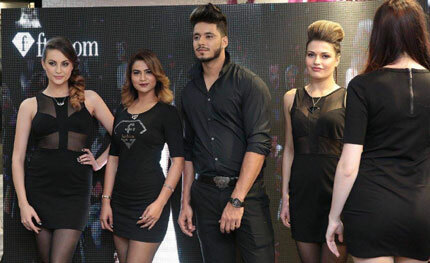 According to Tamanna Singh, F Salons potpurri of beauty & salon services are at par with international standards and will take beauty & makeovers trends several notches up. For today's men and women who are looking for best in quality ,trends,products and value for money , F salon is a one stop destination. We define ourselves as affordable luxury and want one and all to come and experience it. Col. Gautam, spoke about the future phase wise expansion plans of the F salon in north India. He said," we are looking for like minded people who have the zeal and the passion for the brand. Complete support and hand holding of franchisees is assured, ensuring that the highest standards of quality of service to clients as per brand standards are delivered ". Stunning models from F TV showcased most happening and recent trends in makeovers and hair couture designed and conceptualized by F Salon. The F Salon's grand opening was attended by the who’s who of New Delhi like Ala Madhu, Farheen Prabhakar, Designers Ravinder & Tejinder Singh, Parul Mahajan, Designer Rosy Aluwalia, Dr Varun Katyal, Designers Ajay from Buzay, Rajni Subba, Designer Amit Talwar, Ruby Yadav, Jewellery Designer Aakash Aggarwal, Jewellery Designer Pankaj Verma with Shalini Verma, Reenu & Pooja Chabra, Interior Designer Deepa devrajan. The F Group is the world’s largest media and lifestyle company with interests in broadcast, hospitality, residences, education and now wellness. At the first F Salon in India, the brand will present the latest hair & skin concepts and styling taking inspiration from the global runways and trends. With access to the global fashion & beauty community, F Salon will present the best international talent to Spread over 3000 sq ft, the 14 seater salon has 10 haircut stations, 6 VIP Room, 4 facial room, 2 body massage room and 5 exclusive bridal room. About 18 qualified and certified talent, with excellent knowledge in providing high-end beauty services are engaged to provide top of the line experiences. The talent has been trained by some of the best international experts in each service category ( hair, make- up and Salon service offerings include: Luxurious Facial & Body Therapy, Haircuts, Perms, Hair Coloring, Highlights, Waxing, Manicures & Pedicures as well as a wide selection of quality hair and nail care products. The Salon offers a wide range of services designed for groom and bride.